You are already familiar with the concept of "average rate of change". 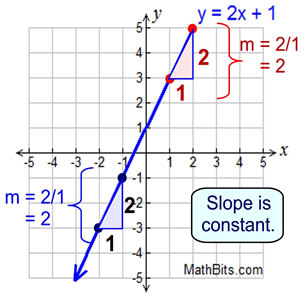 A special circumstance exists when working with straight lines (linear functions), in that the "average rate of change" (the slope) is constant. No matter where you check the slope on a straight line, you will get the same answer. When working with non-linear functions, the "average rate of change" is not constant. The process of computing the "average rate of change", however, remains the same as was used with straight lines: two points are chosen, and is computed. 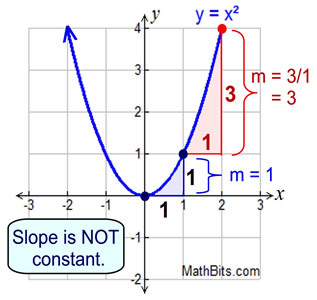 FYI: You will learn in later courses that the "average rate of change" in non-linear functions is actually the slope of the secant line passing through the two chosen points. A secant line cuts a graph in two points. When you find the "average rate of change" you are finding the rate at which (how fast) the function's y-values (output) are changing as compared to the function's x-values (input). When working with functions (of all types), the "average rate of change" is expressed using function notation. While this new formula may look strange, it is really just a re-write of . Remember that y = f (x). Then our slope formula can be expressed as . If we rename x1 to be a, and x2 to be b, we will have the new formula. Finding average rate of change from a table. Function f (x) is shown in the table at the right. Find the average rate of change over the interval 1 < x < 3. If the interval is 1 < x < 3, then you are examining the points (1,4) and (3,16). From the first point, let a = 1, and f (a) = 4. From the second point, let b = 3 and f (b) = 16. The average rate of change is 6 over 1, or just 6. The y-values change 6 units every time the x-values change 1 unit, on this interval. Finding average rate of change from a graph. Function g (x) is shown in the graph at the right. 1 < x < 4. If the interval is 1 < x < 4, then you are examining the points (1,1) and (4,2), as seen on the graph. From the first point, let a = 1, and g (a) = 1. From the second point, let b = 4 and g (b) = 2. The average rate of change is 1 over 3, or just 1/3. The y-values change 1 unit every time the x-values change 3 units, on this interval. Finding average rate of change from a word problem. b) Find the average rate of change of h between t = 0 and t = 2? a) In the formula, , the numerator (top) is measured in feet and the denominator (bottom) is measured in seconds. This ratio is measured in feet per second, which will be the velocity of the ball. b) Start by finding h(t) when t = 0 and t = 2, by plugging the t values into h(t).